Simple Plan were one of the first alternative bands I ever listened to, and no matter how much they’ve changed since I first heard ‘No Pads…’ their music will still ultimately mean something to me. Sure, they’re getting older and becoming much harder to take seriously as a result of their style not always changing with them but they’ve certainly always been able to write memorable, albeit occasionally cheesy songs. ‘Get Your Heart On: The Second Coming’ contains seven tracks written during the sessions for ‘Get Your Heart On’, so it shouldn’t come as a surprise that they are fairly similar to the bands last full-length – more pop than punk whilst remaining deliciously melodic and catchy. Where the EP differs is that it borrows from a lot of the bands material across their discography. Opener ‘Ordinary Life’ could have been plucked straight from ‘No Pads, No Helmets… Just Balls’, being angsty and reflective, as well as insatiably catchy and anthemic. As lead vocalist Pierre Bouvier sings ‘I don’t want to wake up with my best years behind me’ it seems like a sentiment the band have taken on board. It’s also the best song the EP has to offer and follows with ‘The Rest Of Us’, which is tame in comparison. If One Direction where trying to appeal to the alternative music community then the second track is probably how they’d sound. It’s by no means a bad track but it’s definitely the most ‘pop’ Simple Plan sounded, and it shows against the punk nostalgia of the first track. As the first two tracks suggest, there is a good amount of variety on ‘Get Your Heart On: The Second Coming’ whilst still maintaining that trademark Simple Plan energy via infectious vocals and sunshine instrumentals. Fifth track ‘In’ would slot nicely onto the bands mainly disappointing self-titled, starting fast and energetic before dropping off for a more lax verse. The songs explosive chorus is one of the EP’s best, surging along on dynamic instrumentals whilst Bouvier applies normally excellent vocals to some fairly lacklustre rhymes. Moments like these perfectly capture the fire that makes Simple Plan so appealing, whereas the following acoustic track ‘Lucky One’ shows them at their most sentimental, emotional and affecting. Jaunty toe tapper ‘Outta My System’ displays yet another varying style which makes it less contagious but more engaging, as well as offering a change of pace before the rapid ‘In’. Weakest track ‘Outta My System’ is poor, borrowing electronic elements and down tuning the vocals before throwing in a sparkling chorus reminiscent of All Time Low. If the band were ten years younger it’d work brilliantly, but they aren’t, and the track ultimately falls flat. Simple Plan should be commended for not aging musically as most bands would, but they struggle to compete with younger artists when it comes to songs about getting over exes and partying. The main area the band suffers, as per usual, is lyrically. For an EP that has two sexual innuendos in its title I suppose you’d expect nothing less. ‘Get Your Heart On: The Second Coming’ shoots out lame cliché after lame cliché, and most of the time it’s bearable, whilst at others it’s vomit inducing crap. None of the songs shine lyrically and instead rely on excellent vocal melodies or energetic instrumentals to detract from some of the worst lyrics this year, in a genre known for its poor use of the pen. 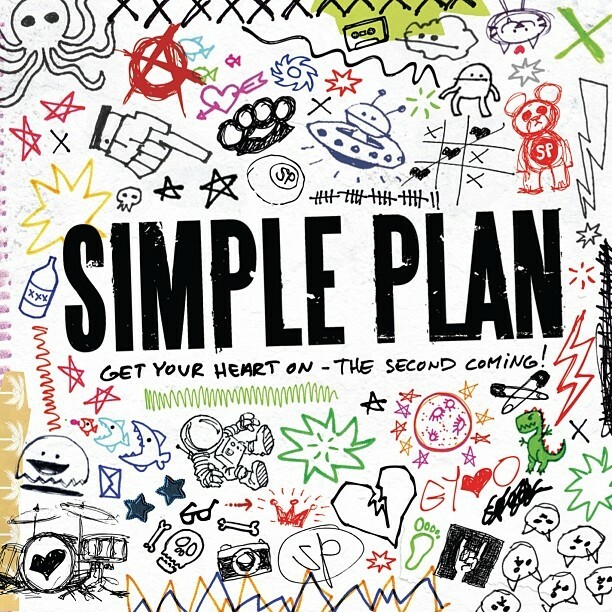 Like most fans, I’d take the Simple Plan of 2003 over the Simple Plan of 2013, but ‘Get Your Heart On: The Second Coming’ does show that there’s still a lot to love about the Canadian five-piece’s music no matter how it compares to past glories.